Jeffrey Welch's Blog: What Is Your Dog’s Relationship With Stuffed Animals? What Is Your Dog’s Relationship With Stuffed Animals? Editor’s note: Have you seen the new Dogster print magazine? Or in the waiting room of your vet’s office? This article appeared in our Fall issue. Subscribe to Dogster and get the magazine delivered to your home. Some dogs see a stuffed toy, and their prey drive kicks in. Others like to retrieve them or chase them. What about your dog? Take this quiz to find out the hows and whys of your dog’s relationship with her stuffed animals. b. Plays fetch for a while. She gently carries it back to you until your arm is tired. c. Carries it around with her and protects it. Aww, she thinks it’s her baby! d. Sometimes sleeps with (or humps!) stuffed toys. Or carries it around for a while, then chews it up. a. The squeaker toy. She loves killing stuffed animals! b. Any fetch toy! She can’t get enough fetch. c. All of them. She gathers them up and guards them. d. So many toys! How can she choose? It’s toy overload! a. Goes right for the jugular. As it squeaks pathetically between her jaws, you decide that next time you’ll buy a toy with replaceable squeakers. b. Wants you to throw it so she can retrieve it for you. You decide her next toy will be an automatic fetch machine. c. Takes it from your hand and leaves. Later on, when you try to take one of the other stuffed toys from her bed (gotta rotate those toys to keep them interesting! ), she growls and barks at you. d. Just looks at you. Squeaky, squeaky. Nope, still just a questioning stare and a head tilt. a. Must have some terrier in her. She loves killing stuffed animals! b. Is a retriever or probably has retriever blood in her. She certainly acts like it! c. Is not a guard dog breed, but she guards her toys and will get aggressive if you try to take them away. d. Is just a weirdo. She doesn’t fit any category! Dog with toy by iStock. Dana Ebbecke, an Animal Behavior Counselor at the ASPCA Adoption Center, is a certified professional dog trainer who has worked with dogs professionally for more than 10 years, so she’s seen all types of interactions with stuffed toys. The most exciting part of a stuffed toy is the squeaker, she said. But this results in a lot of destroyed toys, so buy durable ones and those with replaceable squeakers, and rotate toys regularly. Also supervise your dog to make sure she’s not eating anything she shouldn’t be! So if your dog loves fetch and gently picks up toys to bring back to you, perhaps she has some retriever in her lineage. 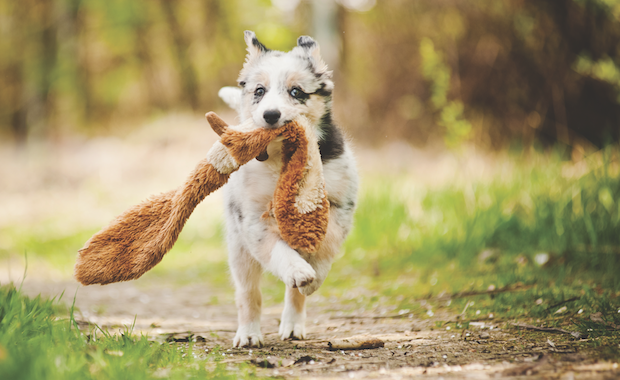 “Sometimes breed types can contribute to how a dog plays with toys,” she said, but “it varies from individual to individual.” Your dog may just be gentle and love playing fetch! If your dog gets mad at you when you try to take away a toy, or if she obsessively carries a toy around, you probably already know there’s a problem. Your dog may not fit any of the typical characteristics — she may ignore toys, be a purebred retriever who never wants to retrieve, or play differently with different stuffed toys. “Each dog is an individual; different dogs have preferences on how they interact with toys,” she said. As long as your dog doesn’t eat inedible toys and displays healthy behaviors, it’s OK if she doesn’t fit into any category! The post What Is Your Dog’s Relationship With Stuffed Animals? appeared first on Dogster.